I am researching the life and work of Captain James William Petavel (1870-1945). Captain Petavel was the second son of Rev. William Petavel, Minister of the Swiss Church from 1866 to 1879, and a nephew of Rev. Emmanuel Petavel-Olliff, Minister of the Swiss Church from 1863 to 1866. Captain Petavel served in the Royal Engineers from 1889 till 1900, when he retired from the military. He spent about half his time in the military in India, and in 1914 he returned to India, where he spent the remainder of his life as a pioneering educator, mainly based in Calcutta and then in Hyderabad. He was a prolific author, publishing about 30 books and pamphlets, and at least a hundred articles in journals, magazines and newspapers. In the early 1900s he was mainly based in West Yorkshire, and between 1909 and 1914 he directed Moore Place, the Stanford-le-Hope Educational Colony in Essex. 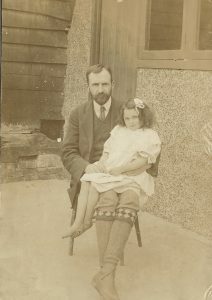 I would be delighted to hear from anyone who is interested in Captain Petavel, or who has knowledge of any relatives, including his two wives (Jeanne Bertha Touchon, and Mabel Hannah Parsons), and six children (Evangeline, Harold L., Gladys May, Ellen Miriam, Frederick, and Marjorie Dora) I would also greatly welcome information on records that might be available in Neuchâtel, the home town of the Petavels, or elsewhere in Switzerland.